–On June 25, the U.S. Supreme Court vacated a ruling by a Washington State court against florist Baronelle Stutzman. The court returned the case to the Washington Supreme Court, instructing reconsideration in line with the Masterpiece Cakeshop decision earlier in June. In the Masterpiece case, the court had determined that Colorado cannot compel Christian baker Jack Phillips to bake a cake for a homosexual wedding. In Washington, Stutzman had similarly faced compulsion to violate her Christian beliefs. –The Canadian Conference of Catholic Bishops has expressed dismay at a June 15 decision by our northern neighbor’s Supreme Court which upheld the decision of two provincial bar associations to prevent graduates of a proposed law school at Trinity Western University from practicing their profession. The school is an Evangelical Protestant institution which requires its students to agree to a “covenant” to live by Christian moral principles. The court agreed with the plaintiff, a self-described “cis-gendered lesbian lawyer,” that this constitutes discrimination against those engaging in extra-marital or homosexual relations, creating a public interest strong enough to justify limiting religious rights. Two dissenting justices decried the decision as a blow against the Canadian Charter of Rights and Freedom, which lists “freedom of conscience and religion” as the first of five fundamental freedoms everyone in Canada possesses. –Fallout from the repeal of constitutional protection for the unborn in Ireland’s constitution was not long in coming: Taoiseach Leo Varadkar has announced his intention to include in implementing legislation a provision compelling Catholic hospitals to perform abortions. Some Irish pro-lifers are concerned that the Church’s position has already been fatally compromised. In 2013, when Ireland began to allow abortion in some circumstances (largely threat to the mother’s life), two Dublin-based Catholic hospitals agreed to the new measures. The thought at the time at these institutions was that the situation would never arise in which abortion would have to be performed in them–and in fact, none have been–but concern is now that Catholic hospitals have little ground left to stand on in resisting pro-abortion measures. The month of August falls entirely within the cycle of Ordinary Time. 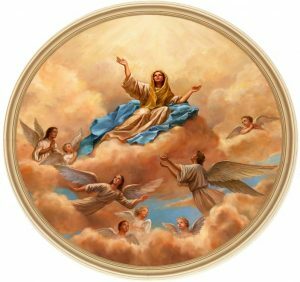 The Assumption of the Blessed Virgin Mary, August 15, is a holy day of obligation. Also, known as Lughaidh or Lugaid, this saint was a boy of Limerick herding livestock who earned a reputation for sanctity and was sent to the monasterey at Bangor, where he was under the tutelage of St. Comgall. After ordination to the priesthood, he was tasked by his abbot with making other monastic foundations, the most important being what came to be called Kyle, in the Slievebloom Mountains. Molua may have made a trip to Rome, where he submitted the monastic rule which he had drawn up to Pope Gregory the Great. Some of the things said about him may result from confusion with another man. Abel appears to have been one of the many Irish missionaries who aided St. Boniface in evangelizing the Germanic peoples of continental Europe. He was appointed bishop of Reims by Boniface, but was never able to claim the see due to its occupation by a rival claimant. He ended his days as abbot of Lobbes, in modern-day Belgium. Though not closely associated in life, these two men have come to be commemorated on the same day. Felim came from a family of saints. He is traditionally considered the first bishop of Kilmore. Nathy was a priest from Sligo. Blaan, also known as Blane, was a Scot, but spent seven years in Ireland under the tutelage of Sts. Comgall and Canice. He then returned to his native land, where he became a bishop. The chronology of this saint is uncertain, but if dates assigning her to the 6th century are trustworthy, then she could not have been associated with St. Patrick, as some sources suggest. Attracta, or Araght, was of noble birth. When her father refused to allow her to consecrate her life to God, she fled from home. She founded a hospice for travellers on Lough Gara, which was in operation till 1539. There are many fanciful stories about her, at least one suggesting that she was not always able to conquer an urge to hold grudges. She is the patroness of the diocese of Achonry. Little is known of Lelia. She may with probability be identified with Liadhain, great-grand-daughter of the prince Cairthenn baptized by St. Patrick. She gave her name to Killeely, near Limerick. Also known as Muredach, this is another saint who was not likely to have been a companion of St. Patrick, as some accounts allege. He is reputed to have been the first bishop of Killala. Fachanan is the patron of the diocese of Ross, of which he was the first bishop. He was born at Tulachteann, was a pupil of St. Ita, and founded the monastery of Molana on the Blackwater River. Most significant of all, he founded what came to be the famous monastic school of Rosscarbery in Cork. Mochta is mentioned in the lives of St. Patrick, whose disciple he was. Like Patrick, he was a Briton by birth, though his coming to Ireland was under different circumstances, Mochta’s parents having brought him there as a child. An interesting story has him being rebuked by St. Patrick for questioning the literal truth of the ages of the patriarchs as recorded in the Old Testament. This saint’s name is often Anglicized as “Eugene,” though “Owen” is more correct. His life relates that he was one of three boys carried off from their home in Ireland, first to Britain, then to Brittany, where they were enslaved to work at grinding grain. When their master returned one day to find the three reading while angels worked the mill, he ordered their release. They found their way back to Ireland, and Eoghan became a monk with St. Kevin at Kilnamanach in Wicklow. Later, he aided St. Tigernach in the founding of the monastery at Clones, and finally settled with some followers at Ardstraw in Tyrone, where he became the first bishop. Aidan’s birthplace was Ireland, though we know virtually nothing of his early life there. We are fortunate in having some account of his later life from the English monk, Bede, who was a careful historian. Aidan was a monk of Iona when one of his brethren returned from an unsuccessful mission to the kingdom of Northumbria in northern England. Northumbria had been Christianized earlier from the south, but the interlude of a hostile pagan dynasty had virtually wiped the Faith out there. The sainted King Oswald requested a monk of Iona to re-evangelize his people, but the chosen monk’s extremely rigorist approach bore little fruit. When Aidan suggested that a different approach was needed, his brothers responded by appointing him to the mission. Oswald established him as bishop on the isle of Lindisfarne, and Aidan also established a monastery there, under the rule of St. Columcille. This grew to be one of the greatest monastic establishments in the British Isles. Aidan and his disciples meanwhile succeeded in bringing Northumbria back into the Christian fold. Bede desrcibes him as a man who, though a leader of his society, always remained humble and compassionate. He devoted considerable time to the plight of slaves and unfortunate children.